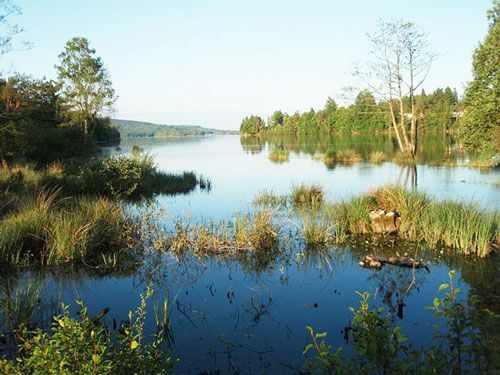 The Lac de Vassiviere is is a man-made lake located in the heart of the Limousin. It spreads over the department of Haute-Vienne and Creuse, and to the northwest of the Millevaches Regional Nature Park, a protected nature area. It was created between 1947 and 1950 by Electricité de France in order to produce hydraulic energy. Industrial development indeed triggered a massive increase in energy requirements after WWII. A power plant was therefore needed in order to support this development and supply electricity to the Limousin area. The valley of the Maulde, wider than the Vienne's, was therefore selected for this ambitious project. However, the small river’s water flow was insufficient. EDF built an important network of dams, canals and underground tunnels in order to capture the waters from the countless neighbouring streams in order to feed the Lac de Vassiviere. The power plant of Peyrat-le-Château was commissioned in 1952. The Lac de Vassiviere today translates in a series of very impressive figures. It is located 650m above sea level. 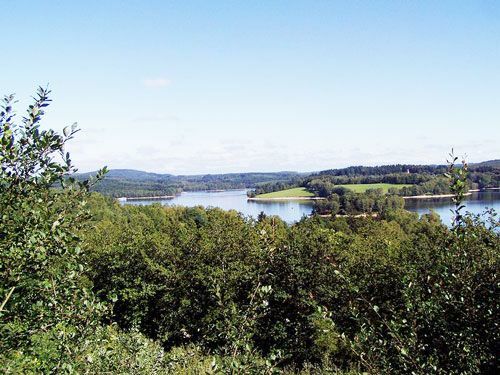 It has an area of nearly 1,000 hectares, and is therefore the largest lake in the Limousin Region and the 6th largest in the Massif Central. It is one of the largest man-made lakes in France and the 23rd largest French lake. It has a capacity of 106m3 million. However, it is partially emptied once a year in September in order to evacuate the water produced by the autumn rains and the melting snow in the spring. The power plant annually produces the electricity needed to power a city of 40,000 inhabitants. Located in the heart of vast forests, the Lac de Vassiviere is also equipped with two 1500m long zones reserved for seaplane water bombers scooping. The creation of the lake resulted, however, in the destruction of eight villages and hamlets, including the former village of Vassiviere. 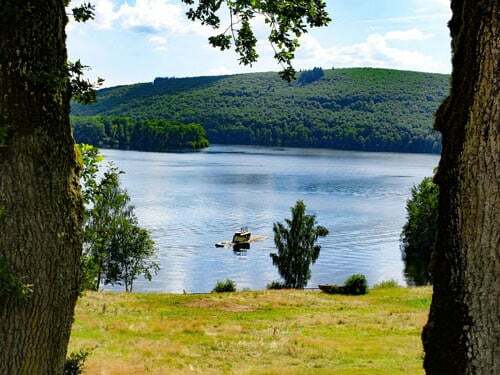 The Lac de Vassiviere is also a fantastic tourist area initially developed in the 1960s-1970s with the support of the General Council of the Creuse department. The Lac de Vassiviere is today the main leisure park in the region. The Regional Council of Limousin has owned it since 2008. A significant tourist infrastructure was introduced. Five patrolled beaches, a small marina for water skiing, canoeing, wake-boarding and windsurfing, hotels, holiday villages, campsites, B&Bs, self-catered cottages and restaurants are indeed scattered over 45km of shore. There are also numerous hiking and mountain bike trails. A 30km shoreline trail (Sentier de rive) runs around the lake and through a series of valleys, moors and woods, sometimes on bridges on piles or dykes. Taxi boats are also available to holidaymakers who want to explore more. A road circling the lake was also opened in order to serve the different bases and villages scattered around. This 21km road was named Circuit Raymond Poulidor in order to pay tribute to the famous cyclist who is a native of the region. These impressive tourist facilities combined with the beauty of the landscapes of the Plateau of Millevaches, composed of bogs, moors and forests, generate a constant flow of holidaymakers and tourists throughout the summer period. The former Château de Vassivière stands on the Ile de Vassivière. This 70-hectare island was formed in the middle of the lake after the flooding of the valley. It houses a restaurant, as well as temporary exhibitions. A contemporary art centre was founded on the island in 1990. The architects Aldo Rossi and Xavier Fabre designed the unusual building. The art centre indeed consists of two structures, a tower-lighthouse and a rectilinear gallery facing the dam. Both are located at the edge of a thick forest of conifers. The park is a large open-air museum. A marked path leads the visitors to the discovery of a series of contemporary sculptures. The Centre International d’Art et du Paysage is dedicated to contemporary artistic creativity, research, experimentation and production. It thus offers works that can sometimes be perceived as… quite different.